Best Allavino Wine Cooler (March 2019) Reviews - Are Allavino Flecount Wine Cooler Any Good? Allavino Wine Coolers are well known for their sturdiness and reliability. If you’re looking for a sturdy and large wine cooler which can store any kind of bottles in it, then Allavino FlexCount VSWR36-2BWFN might be the one for you. The size of this cooler/refrigerator is huge compared to your standard dual zone cooling wine cooler. The reason behind this is simple this isn’t your regular dual cooling wine cooler. Allavino presents a perfect solution for avid wine drinkers who enjoys the taste of different types of wine and who likes to collect them on a regular basis. This large wine cooler can store up to 36 bottles at a time, and you can also store more jumbo sized bottles of champagne or pinot. The regular Dual zone coolers can hold only regular sized bottles that of 750ml. If you wish to store larger bottles then, you need to shuffle the shelves a bit. There are total 12 shelves, and each shelf can hold up to 3 bottles. And since it’s dual zone you can set a different temperature for both the zones. The temperature on both the zones can be set from 40 degrees Fahrenheit and 65 degrees Fahrenheit. This is a huge plus point compared to other dual zone coolers, where there is a limit of 55 degrees Fahrenheit for the low zone. The overall design of this beast also looks great, and you can use it as both freestanding units, or you can build it into your cabinet. The design would look good in any setting. The price on this one is a bit on the higher side but considering how good the product is we’d say it’s worth it. You can check some detailed reviews from the customer who bought this here. You can also check other dual zone cooling wine coolers review here – Haier 18-Bottle Dual Zone Curved Door Wine Cellar Review or AKDY 21 Bottle Dual Zone Thermoelectric Freestanding Wine Cooler Review. 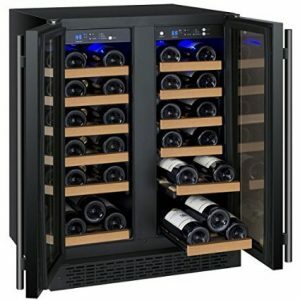 We’ve also compiled a list of 10 best wine refrigerators right here. If you’d like to suggest us any particular product or if you’d like us to review any specific products, then please do share your suggestions in the comment section below.